The thought of the west coast in the USA conjures up images of sun, surfers, busy cities and a summer lifestyle. 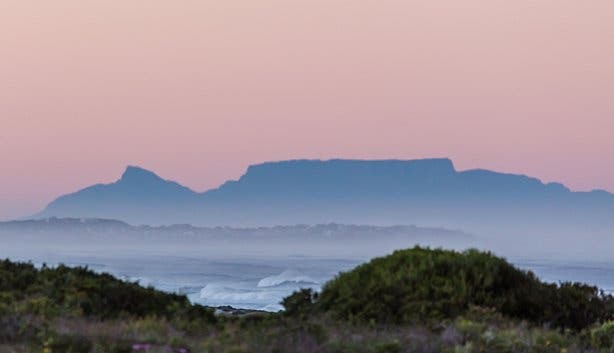 South Africa’s West Coast is the opposite of busy. All it takes is an hour’s drive (120km) from Cape Town to Langebaan. The 40,000 ha West Coast National Park provides a safe haven for thousands of seabirds, who roost on the sheltered islands and pristine golden beaches. It’s a place to rest, to be with friends and family and enjoy the good things in life. 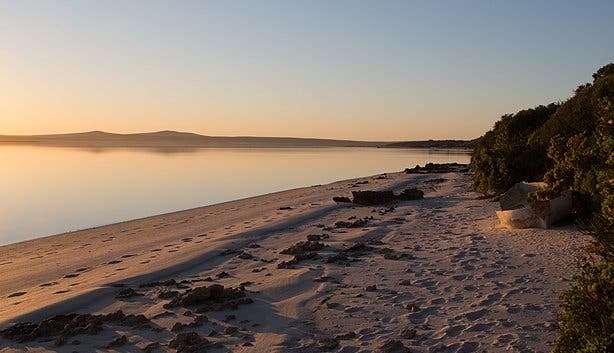 The West Coast National Park was established in 1985 with the aim of conserving the Langebaan Lagoon and surrounding landscapes, also including the islands in Saldanha Bay, and stretches from Yzerfontein to Langebaan. The habitats in the park are varied, and it is of international and national importance in respect of both terrestrial and marine life. The unique and diverse habitats of the Langebaan Lagoon and its salt marshes and wetlands, the granitic islands of Saldanha Bay with its large breeding populations of seabirds, the varied rocky and sandy shores of the coastal strip, the parabolic coastal dune fields and the terrestrial lowland fynbos communities on calcareous soils form the current extent. The area is also extremely rich in fossils and reported remains of human occupation in the park date back to the Holocene Age. 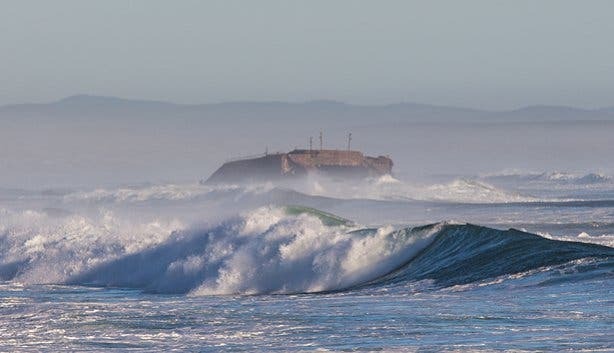 It is recommended to spend a weekend or a couple of days in the West Coast National Park, it offers great accommodation and there is plenty to do to keep you busy. 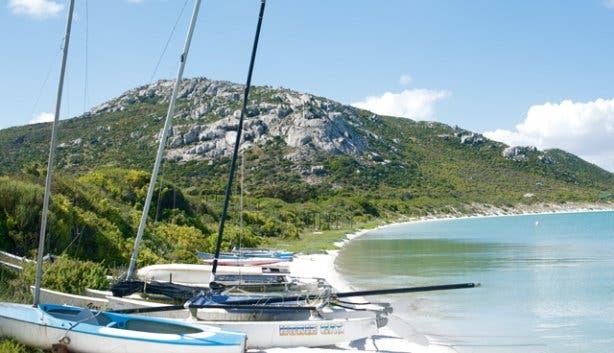 • Enjoy a relaxing day at the beach in Kraalbaai with family and friends. It provides a peaceful setting for a picnic or braai. • Water sports, for example, waterskiing, snorkeling, diving, swimming, fishing, angling, and boating. • Kayaking – enjoy the scenery from a different view. • Kitesurfing – Langebaan offers perfect conditions for the avid kiteboarder. • Visit the Postberg section during the spring flowering season (only open to the public from August to September). 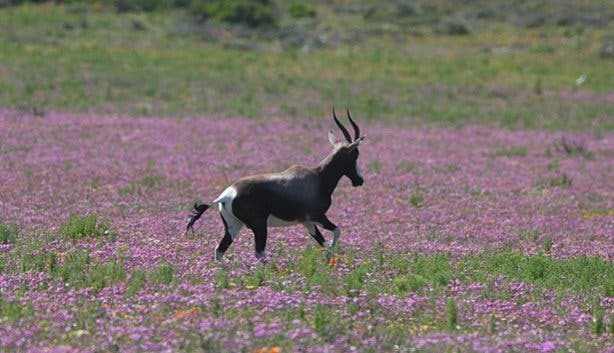 During spring the strandveld is embroidered with a tapestry of multi-hued flowers, while in the Postberg section antelope can be seen in a setting that is as unique as it is idyllic. 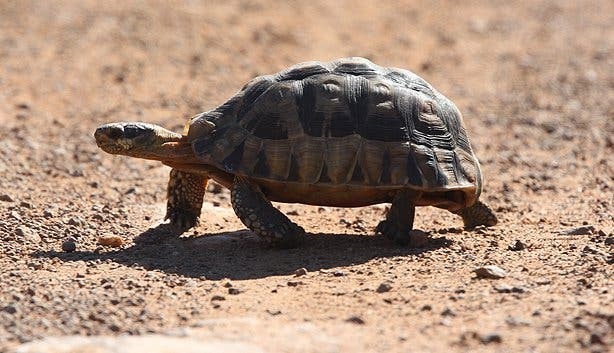 • Game viewing - In the park you will see many tortoises (we counted 200 in October), ostriches, dung beetles, Eland, bontebok, springbok, hartebeest, wiledebeest, Cape mountain zebras, scorpions, and if you’re lucky even snakes. • Whale watching.The southern right whale can be viewed at Tsaarsbank from August to November. • Birdwatching. The West Coast National Park offers birders a diversity of habitats; see below for more information. • Visit the view points Seeberg and Atlantic and combine the Kodak moments with a picnic. 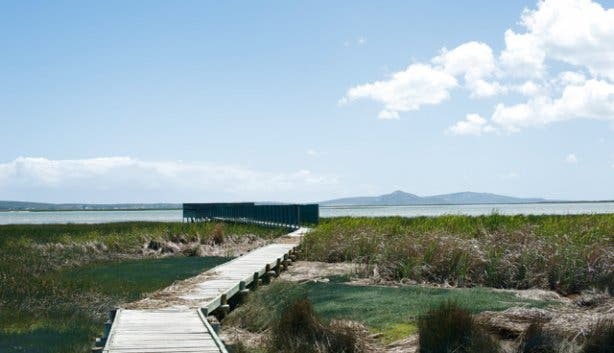 • The Geelbek visitor’s centre is conveniently located at the southern end of the lagoon offering visitors refreshments, curios and information on cultural history and all things to do in the West Coast National Park. • The Geelbek Restaurant, situated in a Cape Dutch building dating back to 1744, prepares traditional food. Try the trio consisting of malay chicken curry, bobotie and denningvleis. Dishes portray a local history enriched by Portugese, Dutch, Norwegian, Italian and Malay influences. The award-winning wine menu offers the best local wines. Geelbek Restaurant is also a conference and wedding venue. (Opening hours 9am -5pm, 7 days a week; +27 (0)22 772 2134). • The stables – a nice venue for school groups (education programmes), community events and team building. • Cycling/mountain biking - Four different routes are available: 30km trail to Geelbek on tarred road (start at Langebaan gate); 70km return trip from Langebaan gate to Kraalbaai; 13km circular MTB trail around the Seeberg view point; 30km circular MTB trail around Seeberg view point and Mooimak. • Have a braai/picnic. There are great official braai spots overlooking the lagoon for day visitors at the Preekstoel information area. The rule: first come, first serve. Here you will also find information on what you can see and find in the West Coast National Park. • Sleep over at the West Coast National Park, it offers great and diverse accommodation. Read our overview for more information. • And hike; see below for more information on hiking routes. The West Coast National Park offers birders a diversity of habitats. 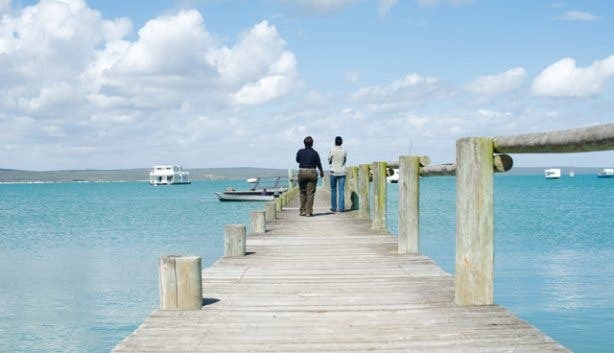 The park is centered around the ecological and aesthetically spectacular Langebaan Lagoon. 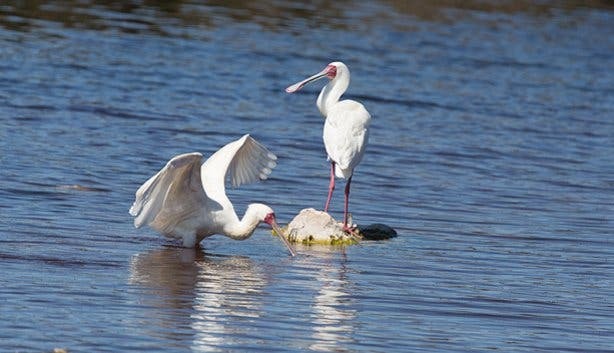 The bird hides give you the opportunity of viewing some of the many bird species found in this area, such as flamingo, ostrich and black Harrier. Bring your binoculars. There are three bird-hides: Geelbek, Seeberg and Abrahamskraal. 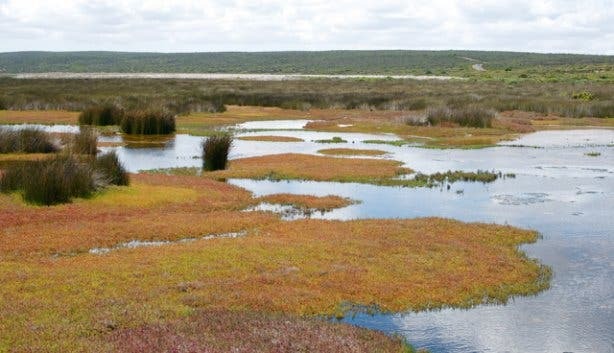 Langebaan wetlands has been allocated Ramsar status, attributed only to sites of international importance. The lagoon attracts hundreds of thousands of waders annually that give the West Coast National Park legendary status on South African bird circles. The terrestrial habitats offered in the park are equally interesting to the birders. Many West Coast specials and South African endemics can be seen with relative ease within the park and 308 bird species have been recorded to date. It is for the above reasons that the West Coast National Park has the honour of being one of South Africa’s Important Bird Areas (IBA’s). Birders need a full day in order to do justice to all the habitats available. If one is keen to work the waders it is suggested that you plan your day around the times when the bird hides will be most productive. The best times to view birds are during incoming or outcoming tides (ask at the Geelbek visitor’s centre for suggested times). Day one takes you along a 14km route through Strandveld. Day two is also 14km long; the trail will take you through Strandveld to Sixteen Mile Beach and back to Geelbek. 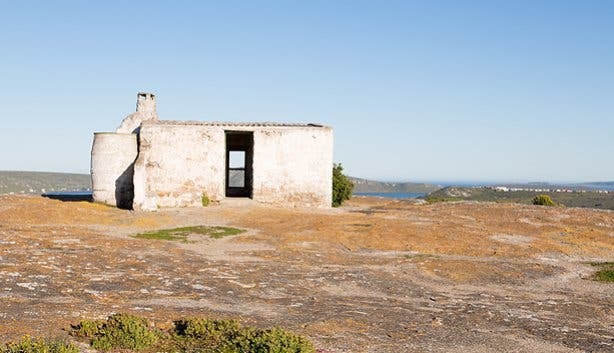 This trail is a short walk from Langebaan gate to Seeberg view point, which is 4.6km long. The trail can take up to 20 people. The hike is 13.9km long and will take you 5 hours excluding breaks (only during August and September). The trail can take up to a maximum of 12 people. On day one you walk 15.5km (6 hours), on day two 11.8km (3.5 hours). 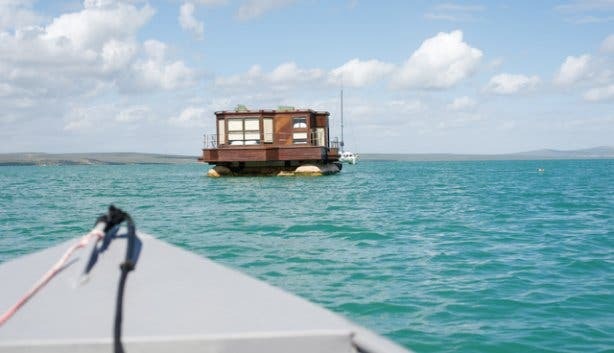 You will spend the night at Plankiesbaai. Guided and educational hikes for school kids are available. Part of the West Coast National Park are islands that are reserved for conservation: Malgas Island, Schaapen Island, Jutten Island, Marcus Island, Vondelling Island and Meeu Island. Yearly highlights are the marathon (42km full marathon, 21km half marathon and 5km fun run) with over 300 participants and in March the cycle race with a 80km and a 30km route with round about 1000 participants. If you are lucky, I hope you will meet Eddie Papier. The Kudo award winner for the 'first ranger on the West coast in 2007' and his eight brothers were born and brought up in the park by a fisherman family. Back then, Geelbek was a cattle farm and very little was going on on the West Coast. After being away for 25 years working as a whaler, he worked in the park for over 20 years and is a corporal ranger. He knows every rock, he says. Conservation fee for South African citizens and residents with ID: Adults: R45; Children: R22 (age 2-11). *Conservation levies increase during August and September for flower season. Check out the Facebook album of our trip. For the ultimate West Coast wild flower experience: glamp on a private game reserve at this luxury Wild Flower Camp. Stay in the loop with our monthly and free newsletter and follow us on Twitter and Facebook.